Stock status is current as of 4/18/2019 8:22 AMET. 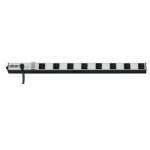 The PS-406-HGULTRA Medical-Grade Power Strip - patent # 7,375,939 - is designed with full 60601-1 compliance and agency listing, making it ideal for standalone use in all patient-care vicinities. 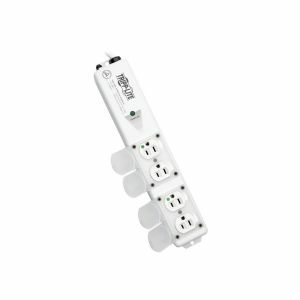 This 120V, 50/60 Hz power strip features a NEMA 5-15P-HG hospital-grade plug and four NEMA 5-15R-HG hospital-grade outlets that include integrated locking safety covers. A patented protection circuit guards against shock hazards by preventing power from reaching the unit's outlets in the presence of a fault. The protection circuit automatically resets itself and restores power once the fault threat is gone. Anti-Microbial Protected with EPA Registered and FDA Compliant Silver Iconic Technology known to inhibit growth of Microbes on surfaces. Mounting tabs and flanges let you install the PS-406-HGULTRA on a wide variety of surfaces. The all-metal housing ensures safety and is guaranteed to last a long time in demanding environments. 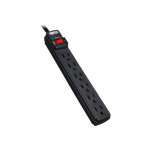 With a switchless design that prevents accidental shutoff and a 6-foot power cord that provides some flexibility in placing the power strip, the PS-406-HGULTRA is a recommended replacement for all non-compliant power strips.